Imaging techniques play a major role in improving the early detection and diagnostic process that helps dentists to make accurate diagnosis. One of the most useful medical images used by dentists is radiographic image, which is used for the treatment of various dental disorders. Segmentation is a fundamental step as it involves separation of an image into regions corresponding to the objects. A simple and natural way to segment such regions is through thresholding. 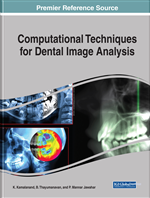 In this chapter, various thresholding techniques such as Otsu's method for global thresholding and Niblack's, Bersen's, and Sauvola's techniques for local thresholding are extensively explained with the help of dental radiographic images. Tooth is the hardest substances in the human body. Tooth plays an important role in chewing as well as in speech. There are various regions present in the teeth. These include enamel, dentin, pulp, cementum and ligaments. The white and firm part of the teeth is called enamel, which is made up of a chemical called calcium phosphate, a rock-hard mineral. A hard tissue, which is next layer to the enamel, is dentin that contains microscopic tubes (Rad, Rahim & Norouzi, 2013). A soft structure of the teeth where nerves and blood vessels pass through is called pulp. Cementum is a tissue that connects the gums, jaw bones and root of the teeth strongly. Structures surrounding the teeth, condition of the teeth and dental disorders like lesions which is difficult to identify medically can be easily detected using dental imaging. Dental disorders are considered to be a major problem in recent days. Some of the common dental problems faced by humans are tooth decay, oral cancers, tooth erosion etc. There are various techniques to diagnose dental problems and the most commonly used technique is dental radiography (Amer & Aqel, 2015; Rad, Rahim & Norouzi, 2013; Said, Fahmy, Nassar & Ammar, 2004). Dental X- ray segmentation is important and necessary in medical diagnosis, which gives information to the doctors regarding dental diseases. Treatments such as dental crown, restoration and root canal are most commonly used diagnostic techniques. There are various modalities for diagnosing these disorders. One such modality is diagnosing it with the help of dental radiographs. Dental radiography is one of the most useful dental exams performed by dentists as it allows the identification of structures which are not revealed on the surfaces of the teeth. A dental radiography is a technique where the production of radiographs of the teeth and adjacent structures are obtained due to exposure to x-rays (Rad, Rahim & Norouzi, 2013). A dental image provides information during dental procedures such as root canal therapy, placement of dental implants (Ribeiro, Dias, de Best, da Silva, Neves & Street, 2014). Dental imaging allows instant and easy transmission of images and electronic storage. They are used to detect wounds, disorders and surroundings of teeth and other parts of the mouth which is not identified medically. Segmentation of dental x-rays does not work well by using traditional techniques (Lai & Lin, 2008). In past decades, continuous evolution in radiological image lead to the development of image processing for medical images, which became a popular tool for researchers in medical fields, includes Dentistry. In the field of computer vision, digital images acts as a medium for carrying information (Subramanyam, Prasad & Anuradha, 2014). In the field of dentistry, segmentation is used to identify various structures such as jaws, wounds, abscess, bones etc (Subramanyam, Prasad & Anuradha, 2014). Segmentation: It is a process of partitioning a digital image into multiple segments to simplify the representation of image into meaningful and easier for analysis. Radiography: It is an imaging technique using x-rays to view the internal structure of the tooth. Multilevel Thresholding: A process that segments a gray level into several distinct regions. Entropy: It is the quantity which is used to describe the amount of information which must be coded for compression algorithm. Thresholds: It is a process of converting a gray level image into binary image. Histogram: It is a graph showing the number of pixels in an image at each different intensity value found in the image. Root Canal: It is a treatment procedure where the pulp is replaced with some inert material. Crown: A crown is a type of dental restoration which completely caps or encircles a tooth or dental implant. Restoration: A dental restoration or dental filling is a treatment to restore the morphology of missing tooth structure resulting from caries or replacement of structure supported by dental implants. Caries: Cavity formation in the teeth caused by bacteria that attach to teeth, form acids, and cause tooth decay.